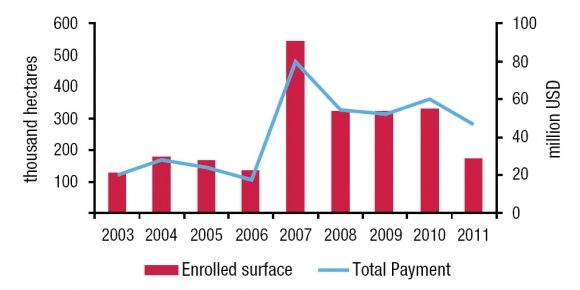 Payments for Environmental Services: Can They Work? Payments for Environmental Services (PES) Programs can be useful policy instruments for achieving conservation objectives through incentive mechanisms. However, the success of such programs depends on the particular solutions that are given to political economy constraints and challenges. The Mexican case provides helpful lessons on this topic, in addition to design and implementation insights. The Mexican PES program has been in place since 2003. It strives to protect well-conserved forests and to have a social impact through payments made to the most marginalized communities. Nevertheless, its impact in terms of avoided deforestation is not very high. This is due to targeting failures that arise from an internal trade-off between social and conservation goals. In order to align both objectives the continuous negotiation of goals and targeting mechanisms between the different stakeholders: government, bureaucracy, non-government organizations (NGOs), and local communities must be kept in mind. Understanding and anticipating this policy process can ensure the desirable outcomes of PES programs in terms of poverty alleviation and conservation. Les programmes de systèmes de paiement pour services environnementaux (PES - Payments for Environmental Services) peuvent être des instruments d’intervention efficaces pour atteindre les objectifs en matière de conservation des écosystèmes grâce aux mesures d’incitation qu’ils englobent. La réussite de ce type de programmes dépend toutefois des solutions spécifiques mises en place pour répondre aux contraintes et problématiques de l’économie politique. Le cas du Mexique permet de tirer des enseignements utiles à ce sujet et donne des éclairages sur la manière de concevoir et de mettre en oeuvre ces programmes. Le programme PES est mis en oeuvre au Mexique depuis 2003. Il vise à protéger les forêts préservées et à avoir un impact social en rémunérant les communautés les plus marginalisées. Toutefois, son impact en termes d’évitement de la déforestation n’est pas très important en raison d’un compromis interne entre les objectifs sociaux et de conservation qui empêche d’obtenir les résultats attendus. Pour harmoniser les deux types d’objectifs, il est indispensable de prendre en compte la nécessité d’une négociation continue des objectifs et des mécanismes permettant de les atteindre entre les différentes parties prenantes : gouvernement, bureaucratie, organisations non-gouvernementales (ONG), et communautés locales. La compréhension et l’anticipation de ce processus d’intervention peuvent permettre d’atteindre les résultats souhaités des programmes PES en termes de réduction de la pauvreté et de conservation des écosystèmes. Los programas de Pago por Servicios Ambientales (PSA) pueden servir como instrumentos de política para lograr objetivos de conservación a través de mecanismos de incentivos. Sin embargo, su éxito depende en gran medida de las soluciones particulares que se den a las limitantes y retos de economía política. El caso mexicano ilustra este tema y provee lecciones útiles sobre el diseño e implementación de un PSA. El Programa de Pago por Servicios Ambientales mexicano ha estado en operación desde 2003. Su objetivo es preservar bosques bien conservados y tener un impacto social a través de pagos a las comunidades con mayor grado de marginación. No obstante, el impacto del programa en términos de deforestación evitada no ha sido muy grande. Esto se debe a fallas en la focalización del programa fruto de la disyuntiva entre objetivos sociales y de conservación. Para alinear ambos objetivos se debe tomar en cuenta la negociación continua sobre el propósito del PSA y los mecanismos de focalización que se da entre los actores relevantes en el diseño y ejecución del programa: gobierno, burocracia, OSCs y comunidades locales. Entender y anticipar ese proceso de política puede asegurar resultados deseables del PSA en términos de conservación y reducción de la pobreza. 2 National Forest Inventory, 2000. 1The Payment for Environmental Services in Mexico (PSAH1) was created in 2003 as a response to high deforestation rates, a severe crisis of aquifer overexploitation, and high poverty rates in rural areas. Mexico is home to over 60 million hectares of forests and tropical jungles distributed throughout the country2. However, between 1993 and 2000 crops and pastures grew significantly at the expense of grasslands, forests and jungles, which were in danger of further deforestation. At the same time, the number of overexploited aquifers had been rising over time. In 1975, 36 aquifers were overexploited (out of 653), in 1985, 80 were overexploited, and by 2001 the number was 97 (14.8%) (CNA, 2004). Finally, poverty rates in rural areas were higher than in urban areas. In 2000, 42.4% of people living in rural areas suffered from extreme poverty (Coneval, 2010) and one-third of communities in the country had a very high level of marginality3. 2Accordingly, the main objective of the PES Program has been to prevent deforestation in poor and marginalized areas of hydrological importance. The government and the owner of the forest sign a 5 year contract whereby the owner receives a payment at the end of each year if the forest is conserved. The payment seeks to cover the opportunity cost for land owners of preserving the forest. The Program focuses on areas where commercial forestry is not feasible, since there are other government programs that support sustainable commercial exploitations. 3The Program is operated by CONAFOR, the National Forestry Commission, and is financed through revenues from water fees that are ear-marked and managed in a trust-fund, Fondo Forestal Mexicano. 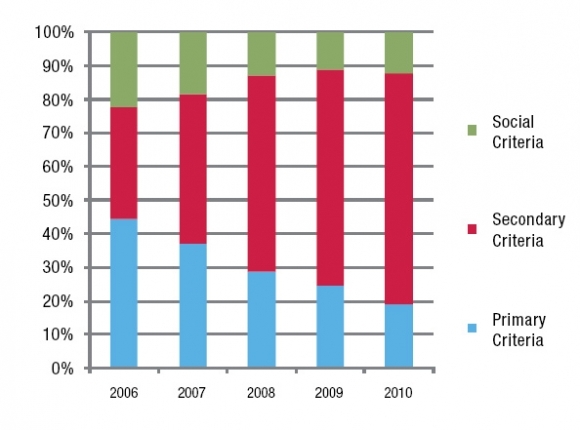 This funding mechanism creates an indirect link between users and providers of the environmental service and also protects the program from time-inconsistency problems that could arise from political cycle issues or budgetary problems if the PES program were financed through the general budget (Muñoz-Piña, Guevara, Torres and Braña, 2008). 4 All monetary figures are at constant 2011 prices. 4Between 2003 and 2011 the PES Program has covered 2.4 million hectares, and has disbursed 384.6 million USD4. The program has grown in size and budget substantially since its inception. In 2003 it enrolled 126 thousand hectares and paid 19.5 million USD. In 2011, 330 thousand hectares were enrolled and 46.4 million USD were paid. Figure 1 shows this evolution over time. 5Nevertheless, it is not clear its impact has increased in line with the number of hectares and funds. Many of the forests enrolled in the program do not have a large deforestation risk, so with or without the payment, they would continue standing. The following sections will discuss the targeting issues the program faces, their probable causes, and lessons learned in order to improve Mexico´s program and provide insights for other PES programs. Figure 1. Enrolled surface and payments PSAH. 6A PES Program’s efficiency and effectiveness depends crucially on where the payments go. Even though all forests provide environmental services and their owners should be compensated for them, with a binding budget constraint it is necessary to choose among plots to achieve maximum impact. 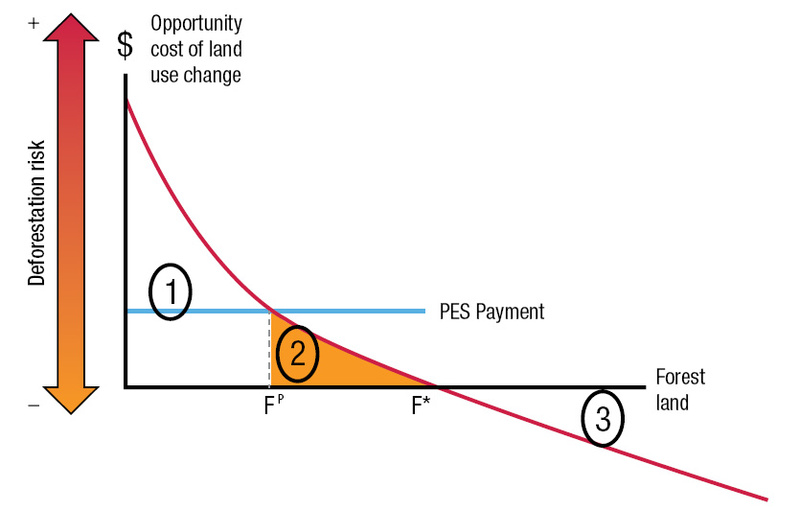 In this sense, if payments strive to change the owner’s decision between cutting down the trees and conserving the forest, we can think of 3 types of forest plots: there is a group of plots with very high opportunity cost of land-use change (group 1 in figure 2). For these, the PES payment will not be enough to avert deforestation. Other mechanisms, most likely regulatory, are needed if those forests are to be preserved. There is another group of forest plots whose opportunity cost of land use change is zero or negative (group 3). These plots will not be deforested, with or without the payment, since alternative activities on that land are not profitable. Finally, there is a group of plots whose opportunity cost is positive and smaller than the PES payment (group 2). This is the target population for the program. The challenge is being able to separate them from the others, particularly from group 3. 7In the case of Mexico, between 2003 and 2007 the Program successfully prevented 18 thousand hectares from being deforested. However, there were 1.8 million hectares enrolled in the program. This means that most plots belong to group 3. This is the targeting failure of the Mexican PES program (Muñoz-Piña, Rivera, Cisneros and García, 2011). 8The way to measure the impact of a PES program is to ask ourselves the question: what would have happened in absence of the program? Since we cannot observe this, we rely on the model of economic pressure for deforestation developed by Mexico’s National Ecology Institute (INE). This model uses satellite images of forests in the country taken at two moments in time, and uses the geographic and economic characteristics of each plot to explain differences between those two moments. Some of the variables used are altitude, slope, distance to roads, distance to towns, and price of corn, among others. Once we know the effect of these characteristics on deforestation we can make predictions for plots that have forests. In this way it is possible to see whether the plots enrolled in the PES program would have been deforested or not in the absence of the program. 9To understand the reasons for the program’s small impact, we will now analyze the PES targeting mechanisms. The Program has 3 targeting mechanisms: definition of elegibility zones, selection of plots, and differentiated payments. Elegibility zones and differentiated payments have been used since 2003. In terms of plot selection, there have been 2 periods in the PES program. The first period (2003-2005) was characterized by a first-come-first-served system. From 2006 onwards, a point system with precedence criteria was set in place. Applications are then graded and sorted according to their total points. Resources are allocated starting with the application with the most points until the budget runs out. 10If we take the criteria directly related to the program’s initial objectives: water scarcity in the watershed, overexploited aquifers, high or very high deforestation risk, and high and very high marginality, to see how targeting evolved during these two periods, we find that there has been a slight improvement in terms of enrolled plots with high or very high marginality as well as high or very high deforestation risk. 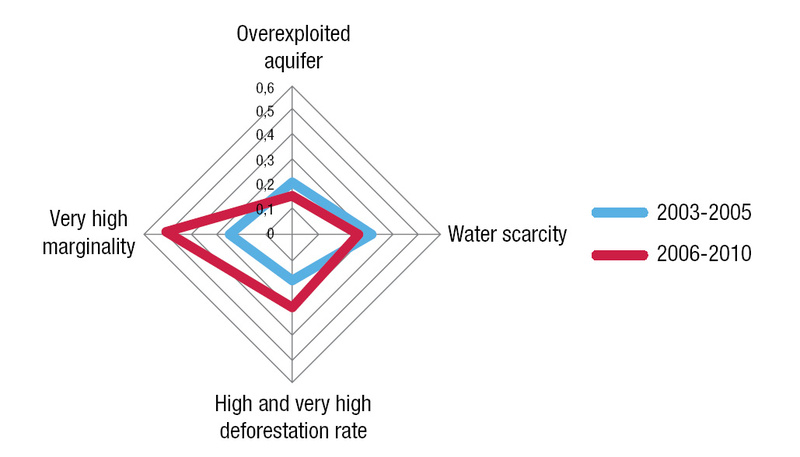 However, there is almost no change in terms of aquifer overexploitation or water scarcity (only 20 and 30 per cent of beneficiaries have these characteristics, respectively) as can be seen in figure 3. Figure 3. Targeting results for the PES program. 11One could attribute the lack of more significant improvements over time to self-selection, since the program is voluntary. That is, plots interested in the program are not on overexploited aquifers or have water scarcity. However, as we discuss in the following section, the main cause seem to be political economy constraints. 12In order to limit the self-selection bias, the PES program defines eligibility zones where the program will operate every year. Similar to the program’s budget and enrolled territory, the number of hectares included in eligibility zones has also increased dramatically over time (6-fold increase between 2003 and 2010). The result is a large set of elegibility zones, where some meet primary criteria and some do not. 13Moreover, it is not clear what the standards are for including new areas. If we compare the attributes of the eligibility zones in terms of hydrological importance, marginality or deforestation risk with the national average (figure 4), we see that the areas allowed to be in the program are, on average, more marginalized and have higher water scarcity than the national average. The opposite is true for deforestation risk and with overexploited aquifers. Around 40 per cent of the country has a high or very high risk of being deforested. In eligibility zones the proportion is only 20 per cent. 14However, even if the set of elegibility zones is large, this can be solved through the mechanism to select individual applicants. As mentioned before, the initial system was a first-come-first-served system that didn’t solve the above mentioned issues, nor selected applicants according to primary criteria. When the point system of precedence criteria was introduced in 2006, the idea was to be able to differentiate between applicants with high hydrological value and deforestation risk from other, less relevant, plots, particularly between plots in groups 2 and 3. Nonetheless, since the first year when the system was implemented the program operators have strived to generate complementarities with other government programs and to ease the administrative process by including secondary criteria in the precedence system. This has led to a reduction in the importance of primary criteria in the selection process relative to these other values over time. 15As shown in figure 5, in 2006 there were 9 selection criteria that could give a maximum of 45 points. Primary criteria represented over 40 per cent of total points. In 2010 there were 26 selection criteria that could give a total of 106 points. Primary criteria represented only 19 per cent of possible points. 16Every year there are applicant plots that satisfy primary criteria that are left out because other, not so good plots get more total points due to the secondary criteria. In this sense, the point precedence system is not being effective in choosing the best plots in terms of conservation impact. 17An important issue is that the inclusion of these secondary criteria does not attract plots with those characteristics. So not only do they divert the focus of the program by selecting plots with little or no hydrological importance and deforestation risk, but they are also ineffective in achieving complementarities between programs and facilitating the administrative process. 18A final targeting mechanism in the program is the use of differentiated payments. As discussed by Alix-Garcia, De Janvry, and Sadoulet (2008), calibrated payments can have an important effect on the program’s efficiency. In Mexico, since 2003 payments have been larger for certain ecosystems that provide better hydrological environmental services (for example, cloud forests). In 2010, payments were further differentiated to account for deforestation risk. However, there is a trade-off between the ecosystems identified with better environmental services and ecosystems with higher deforestation risk. For example, in 2010 there was not a single applicant from high deforestation risk cloud forest (highest possible payment). This is because very few hectares of cloud forest have this characteristic. The cloud forests that remain are usually far away from roads and at high altitudes, so their deforestation risk is low. On the other hand, grasslands and tropical forests have a high deforestation risk, but receive low payments. Table 1 shows the relation between payment and deforestation risk for different ecosystems. 19As we have seen, the low impact of the PES program arises from problems in the diverse selection mechanisms used by the program. Some problems are technical issues and can be solved relatively easily, while others stem from a trade-off between social and conservation goals. These goals are embodied in different groups that have a say in the program’s design and operation. This implies political economy issues that lie at the bottom of the targeting failure and low impact of the program. 20There are two negotiation arenas that define where and how the program will operate. These negotiations and the actors involved can explain to a large degree the targeting failure mentioned above and the difficulty in correcting it. In these negotiations the conceptual difficulty of defining value as a monetary concept or applying a broader perspective in terms of environmental services is well exemplified. 21The first negotiation arena has to do with the program’s budget allocation. The payments for beneficiaries come from ear-marked water fees that are stated in the Ley Federal de Derechos, and thus cannot be easily changed. However, the operational budget for the program comes from the general budget and must be negotiated and voted every year in Congress. 22This has repercussions in the definition of eligibility zones. Given the heterogeneous geographic and environmental conditions in the country, it is difficult to set national selection standards. For example, in the southeast there is very high deforestation risk but very low water scarcity. Conversely, in the north there is very high water scarcity and low deforestation risk. This is a technical issue that could potentially be solved by setting regional standards. However this is not feasible, because if any particular rule is perceived to benefit one state over another, the annual budget negotiation could be compromised. 23Given this constraint, we must live in a second best world where some irrelevant areas are included in eligibility zones. As long as the relevant areas in terms of primary criteria are included, this targeting failure could be corrected at later selection stages. 24This first negotiation arena, between states and the central government (through CONAFOR, the program operator) is basically a struggle for resources and budgetary allocation. It can be countered to some extent through local PES programs, where the state or watershed authority defines eligibility zones in its particular territory and does not have to negotiate with 31 other players (the number of states in Mexico). 25The second negotiation arena is within the program’s technical committee. This second arena is more complex, and it exemplifies the problem of defining value within a PES Program. The technical committee was instituted in 2003 along with the program in order to generate enough political support to get financing. It is made up of government representatives, NGOs, academics, and is open to anyone who wishes to participate. The committee makes recommendations to CONAFOR who chooses whether to implement them or not. It meets 4 times a year and discusses Program results and future operation rules. 26One of the main issues within the committee are the differences in the overall vision and understanding of the Program. The members of the technical committee can be grouped roughly into two camps. One camp believes the program’s objective is conservation by compensating those who have made conservation efforts in the past, regardless of their current deforestation risk and/or hydrological importance. Their conception of environmental value goes beyond a utilitarian view of services provided by the forest. The other camp believes the program’s objective is conservation by compensating forest owners for the opportunity cost of land-use change they currently face. This second camp recognizes the importance of past conservation efforts, but believes that in order to make the program effective, one must choose among plots and set clear indicators to measure effectiveness. Their conception of value is limited to services one can measure and pay for. 27From this fundamental discrepancy about who should be included in the program and why, stem differences in terms of precedence criteria and eligibility zones to be included as well as on how to design differentiated payments. This can be seen in the changes in the program’s operation rules, where year after year the program’s selection criteria have changed. Every year a compromise is reached between the 2 groups so that the program con function within the opeational constraints CONAFOR faces. This explains why even though it’s clear the program is not being as effective as it could be, no decisive actions have been taken to solve the existing problems. 28Payment for Environmental Services Programs can be effective forest conservation tools insofar as they effectively avoid deforestation. In the case of Mexico, even though the PES program has grown in budget and area over the 8 years it has been in place, its impact on deforestation has not increased as much. Many of the forest plots that participate in the Program would not have been cut down even without a payment. This is due to targeting failures that stem from internal differences in perspectives of what the program’s objective should be. The way these conceptual differences on what value means are conciled leads to targeting failures and low impact levels in terms of avoided deforestation. 29In the case of Mexico there are some small changes that could improve the Program’s targeting and effectiveness. First of all, it is necessary to define elegibility zones in a more transparent way and according to primary criteria. Second, more promotion should be made for the PES Program in hydrologically important areas where then umber of applicants is low. This could helps reduce the self selection bias by actively encouraging forest owners in critical areas to participate. 30Third, when it comes to choosing which plots will participate in the Program it is important to redefine the selection criteria and the points given to each, so that primary criteria carry greater weight in the process and all relevant plots are included. Finally, with respect to differentiated payments, a more thorough analysis of what the opportunity cost for different ecosystems is and the deforestation risk they face is needed to offer adequate and efficient payments. 31These changes are especially relevant as the Program grows and more resources, coming from REDD+ or other funds, are invested in it. 32The challenges faced by the Mexican PES program are not unique. All PES programs will be subject to some degree of political pressure from different groups and all agencies will face operational challenges, as well as differences in the basic conception of the PES program. Learning to deal with these issues and negotiate clear evaluation criteria is a priority in order to use scarce public resources efficiently and effectively. 37I would like to thank Carlos Muñoz-Piña, Alfredo Cisneros and Gabriela Angeles at INE for their valuable insights and help to analyze the PSAH Program and its targeting challenges. 38I would also like to thank AFD and the Veolia Institute for their invitation to participate in the International Conference “Poverty and the Environment” where I presented a previous version of this paper. CONEVAL (2010), La pobreza por ingresos en México. México DF, México. 3 The marginality index is composed of indicators for education, housing and public services, labor income, and size and remoteness of population.